January and August are without any doubt two special months for FairMail. We all look forward to these 2 months with anticipation because it’s when we leave the desert Peruvian coast behind and we embark on some crazy adventures on the Andes or in the jungle. 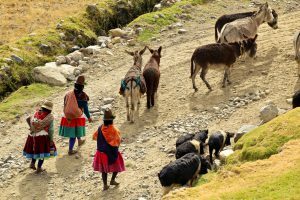 We spent the first week of August exploring the Ancash Region on the Peruvian Andes. FairMail photographers Paul, Melany, Julissa, Medalit and Gerardo went on the trip and we were also joined by a group of 5 travelers from Germany, Switzerland and Italy. 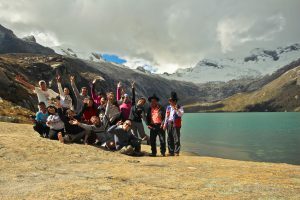 The Ancash region is home to some of the most breathtaking snow-capped Peruvian mountains that make up the Cordillera Blanca and it offers a strikingly varied scenery and we surely weren’t short of opportunities for fun! We climbed up to 4300m, bathed in thermal baths, paid tribute to Mother Earth with the Pachamanca ceremony, learned about local culture and history, we took a lot of pictures an d most importantly…we had a lot of fun! We now hope that many of the pictures that the FairMail teenagers took will become cards soon! Click here to watch the video of the trip. If you want to join us on our next adventure, read here.